Monday morning saw gold hit a record low for its first dip below the $1,200 per ounce mark since March 2017. Yesterday’s drop was driven largely by European selling that kicked in early morning. Many experts see this sell-off continuing in the next few weeks, testing support around $1,189 per ounce. At this rate, the yellow metal is expected to continue to test new lows for as long as the dollar strengthens. The dollar can’t be expected to stay strong forever, however, and in the meantime, there’s no better time to take advantage of low gold prices. While many investors panic and sell when they see prices dip so low, it’s actually better to do the opposite and buy while the metal is available at a discount. That way, when prices climb again, so will the value of your investment. If you’re looking to add the yellow metal to your portfolio while it’s available at such an excellent value, you absolutely must act now. One of the most cost-effective ways to do so is with gold bars, as they often boast lower premiums than most government-issued gold products. Today, we have selection of 1-ounce gold bars (our choice) available at just Spot + 3.5% per ounce* for any quantity ordered. To add discounted gold to your portfolio today, please call us at 800-831-0007 or email us. *Prices subject to change based on market fluctuation and product availability. Prices reflected are for cash, check, or bank wire. 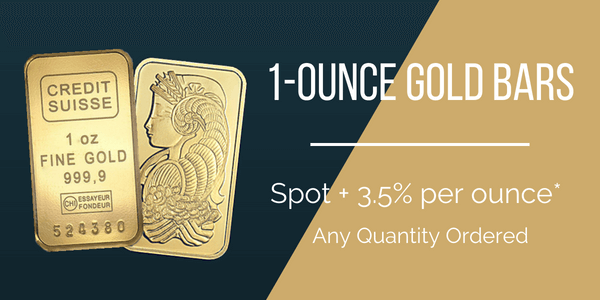 Free shipping, handling, and insurance are available for 1-ounce gold bar purchases of 10 ounces or more. 1-ounce gold bars are available from our choice of mint. Offer expires Friday, August 17, 2018, or while supplies last.